Manger Sets are an important part of our Christmas celebrations. We prepare these Nativity Sets to commemorate the story of a baby named Jesus, who was born to free the all of mankind from our sins. His was a miraculous birth, the fulfillment of a promise by our Lord in the Old Testament. Setting up Nativity and Manger Sets is the most cherished moments of Christmas. In fact there are many ways to set up a Nativity scene. Different parts of the world have their own ways of putting up the Nativity Scene. The choice is completely ours and we tens to follow our traditions. The only significant difference between a Nativity and a Manger Set is the inclusion of the stable - Manger. A Nativity Set may or may not have the stable, but a Manger always have the stable as part of the set. Adding the stable brings in much more relevance and depth to the Nativity Scenes. There are a number pieces that you will need to set up a Manger Set. The first thing that you should have is a crib and baby Jesus at the center of the Nativity Scene. Jesus is kept at the center of the Nativity Scene as he is its focus. On the side of baby Jesus, Mary and Jesus should be placed. Most of us do not place Jesus in the Manger until Christmas Eve. The decision is yours and you can decide where to place The Baby Jesus before Christmas. It is a customary to place a sheep and oxen in the scene as they were the only other ones present at the time of Jesus' birth. There are some additional figures which are usually included in a Manger Set. They include the shepherd and the kings who visited baby Jesus and offered gifts as well. The way to place these figures in the Manger is an option left to you. Some choose an inner and outer circular pattern, placing the figures in it. Mary, Joseph and Jesus are placed in the inner circle as they are the most important ones in the Manger Set. Some place shepherds closer to Jesus, because The Bible says that it was the shepherd who came to first visit Jesus. The kings can be placed next in the circle which can depict the slow journey that they made to visit the new born baby. In some Latin communities there is a tradition of not placing the kings until January 6th. Another popular figure in the Manger set is an angel. 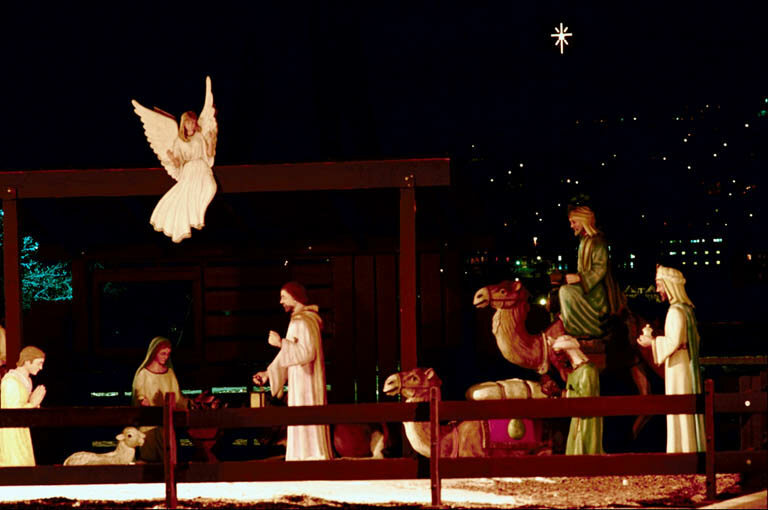 You can place it on the top of the Manger making it feel like the angel is looking from the Heaven to Earth. If this cannot be done then the next best way to place an angel would be near the Holy Family. Manger Sets are popular gifts from Holy Land made out of the famous olive wood. All the Nativity characters are made out of this olive wood and these religious gifts are admired all around the world. The Jerusalem Export House has been bringing the Holy Land to the World since 1969. In 1999 the AZ Trading Co., an international marketing company based in Jerusalem Israel, acquired the company from its founder Mr. Yasha Levitan (RIP). Through the leadership of Mr. Amnon Cohen and the dedicated work of his sons, the company has successfully continued to grow and bring unique products from the Holy Land to the world markets. The company offers both wholesale and retail pricing, with offices in both the US and Israel. Together with his wife, Deb, Alon manages the Jerusalem Export website and US office. For more information please visit http://www.jerusalemexport.com/.